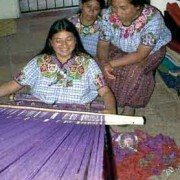 Cojolya weavers María Tiney, María Sosof and Concepción Queju demonstrate the backstrap loom weaving process. 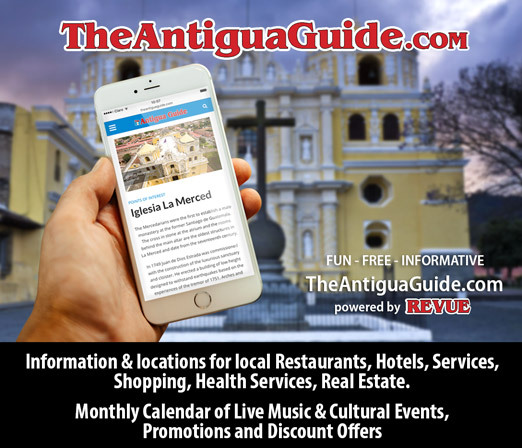 Santiago Atitlán, a bustling indigenous village in the Guatemalan Highlands, has been celebrated by locals and tourists alike for its preservation of backstrap-loom weaving and the traditions surrounding it. 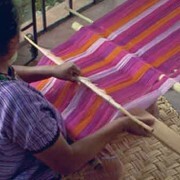 An ancient art, backstrap loom weaving is recorded in the artifacts of the Maya. 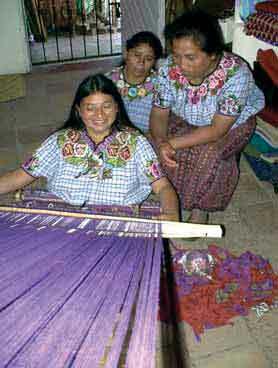 The Goddess Ixchel, archetypal Maya weaver, weaves the cosmos on her backstrap loom. For more than 2,000 years, the skilled hands of Maya weavers have transformed threads into textiles—traditions which women have passed down from generation to generation. This said, Santiago is neither timeless nor immune from change. 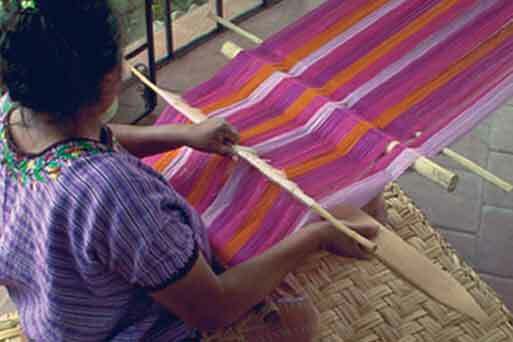 Founded in 1983, the Cojolya Association of Maya Women Weavers, a non-profit organization, has been dedicated for the past 25 years to preserving backstrap loom weaving. In the late 1970s Cojolya co-founder and seasoned designer Candis Krummel, an American living in Santiago Atitlán, became aware of the growing threats to backstrap- loom weaving. Conditions such as discrimination, economic pressures and Western acculturation have increasingly threatened the very existence of this ancient art. 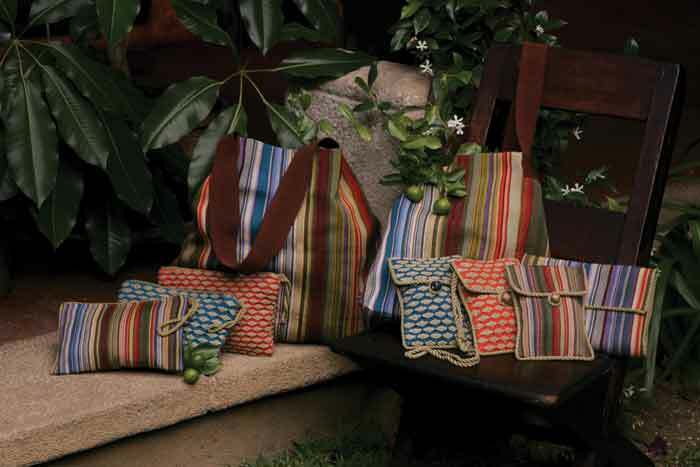 As a member of the Fair Trade Organization, the Cojolya association strives to be responsive to the needs of the approximately 70 weavers, knotters, jaspe makers, warpers and tailors who craft the Cojolya products. Weavers are provided with threads and looms, design services and assistance with the development of infrastructures and markets. After selecting her material, a weaver returns to her home to create her textile as part of her daily routine, in the tradition of her grandmothers. “They weave for a few hours, then cook for their family, weave a little more, then change the baby,” notes Candis. The intricate nature of this process ensures that each product is truly one of a kind. Hence, without disturbing her traditional way of life, a weaver can use her textile heritage to provide an income for herself and her family in a community where there may be no other opportunity for employment. Cojolya weavers use traditional techniques and designs to produce modern women’s accessories, bags, hats and scarves. 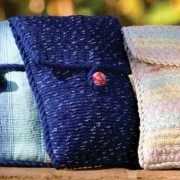 The Cojolya association also weaves accessories for the home, including bed scarves, throws, pillows and kitchen décor. The designs are true to their Maya roots yet contemporary in their rich colors and textures, allowing preservation of traditional techniques while also opening doors to the export market. The appeal of Cojolya products stems from their representation of a lost connection between maker and user, an intrinsically human exchange that was a common bond before mass production and mass marketing. Not only providing economic opportunities to women weavers, Cojolya has also aided them socially. After the 2005 mudslide which devastated Santiago, Cojolya provided 10 houses for their weavers, giving them the seeds of hope for a new beginning. In addition, Cojolya donates $1 for every $40 of sales to the Santiago Onil Stove project, which offers improved wood-burning stoves to the families of Santiago. The Onil stove uses only 30 percent of the wood required to cook on an open fire or other type of wood-fired cook stove. Not only are women saving money on fire wood, they are also reducing the rate of deforestation, which is denuding the mountains surrounding Lake Atitlán. Thank you for this informative article on Cojolya. Their handiwork is truly beautiful and somewhat unique to the area. 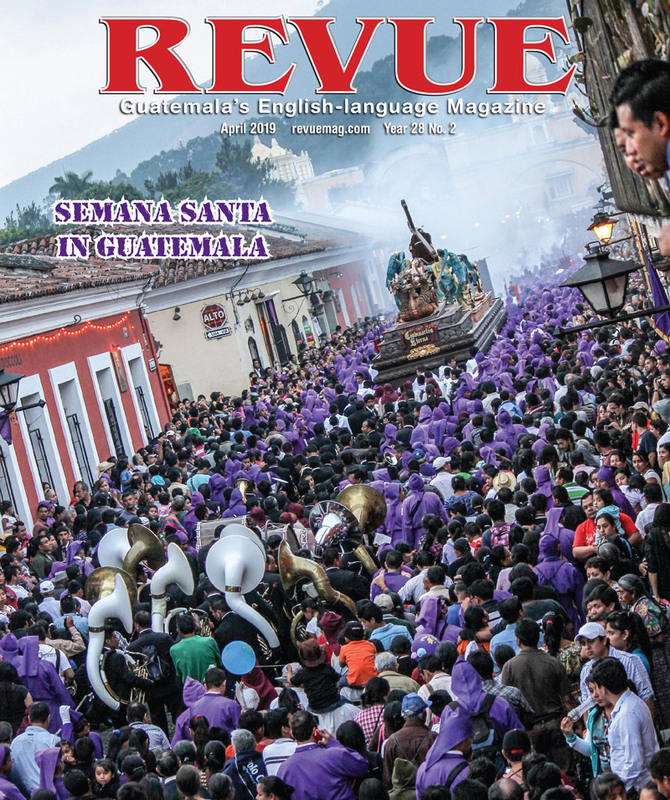 Does this organization have any plans to expand to the other villages around Lake Atitlan? And where does one get info on the Onil wood stove? Thanks for your good work!